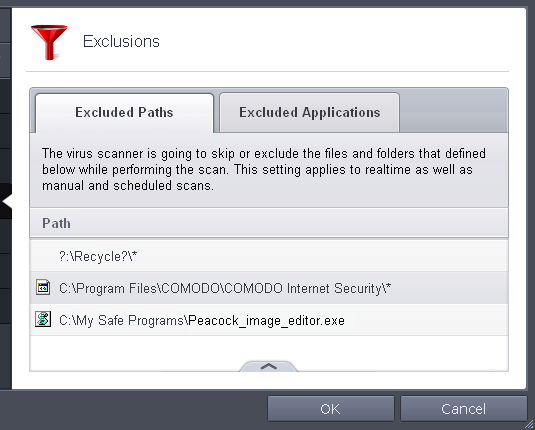 The 'Exclusions' panel under the Antivirus Settings Settings displays a list of paths and applications/files for which you have selected Ignore from the Scan Results window of various scans or added to the Exclusions from an antivirus alert. Click Security Settings > Antivirus > 'Exclusions' tab in the 'Advanced Settings' panel. 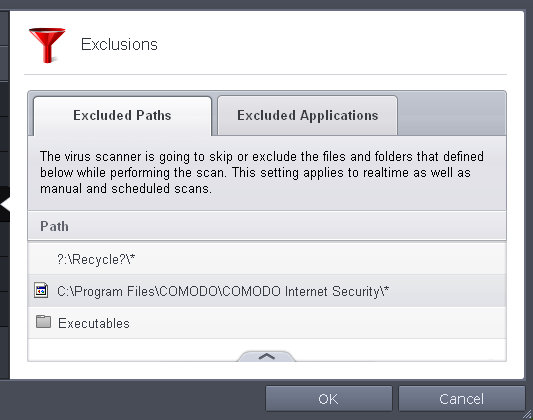 Excluded Paths - Displays a list of paths/folders/files in your computer, which are excluded from both real-time and on-demand antivirus scans. 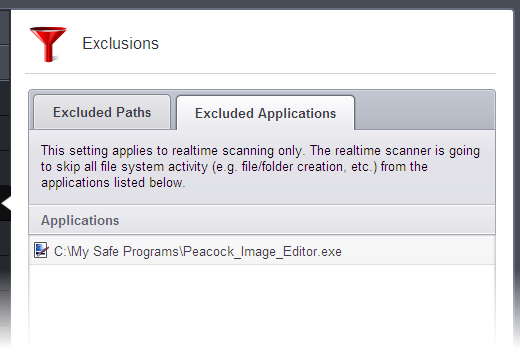 Refer to the section Excluding Drives/Folders/Files from all types of scans for more details on adding and removing exclusion items in this interface. Excluded Applications - Displays a list of programs/applications in your computer, which are excluded from real-time antivirus scans. The items are included on clicking 'Ignore' from the Scan Results window of various scans and Antivirus Alerts or manually. Please note that these items are excluded only on real-time sans but will be scanned on running on-demand scans Refer to the section Excluding Programs/Applications from real-time scans more details on manually adding and removing exclusion items in this interface. You can exclude a drive partition, a folder, a sub-folder or a file from both the real-time and on-demand/custom scheduled antivirus scans at any time, by adding them to Excluded Paths. 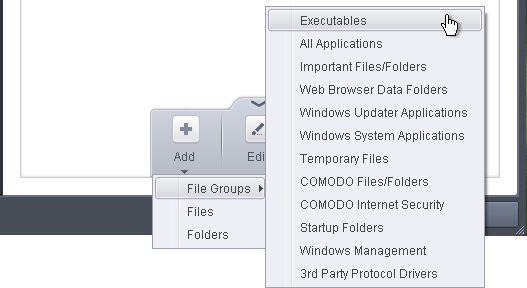 Choosing File Groups allows you to exclude a category of pre-set files or folders. For example, selecting 'Executables' would enable you to exclude all files with the extensions .exe .dll .sys .ocx .bat .pif .scr .cpl . Other such categories available include 'Windows System Applications' , 'Windows Updater Applications' , 'Start Up Folders' etc - each of which provide a fast and convenient way to apply a generic ruleset to important files and folders. To view the file types and folders that are affected by choosing one of these options, you need to visit the 'File Groups' interface. 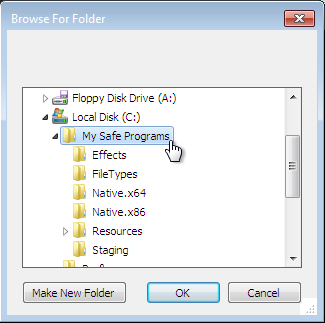 Navigate to Advanced Settings > Defense+ > HIPS > Protected Files, click the up arrow from the bottom of the interface and select 'Groups' from the options. The file groups will be added to Excluded Paths. Repeat process to add more file groups. 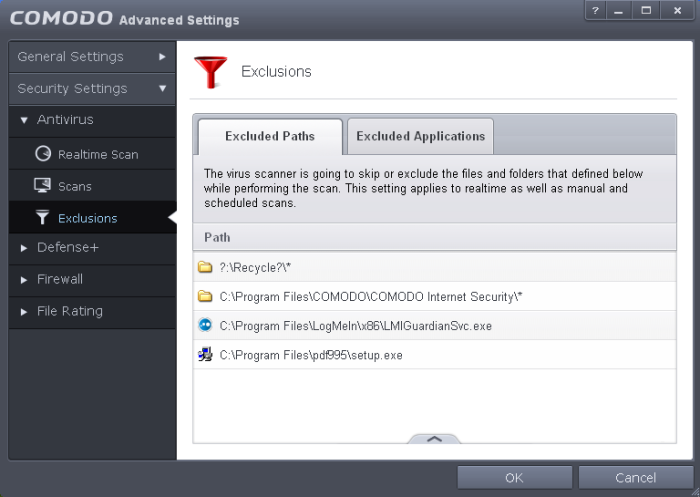 The items added to the Excluded Paths will be omitted from all types of future Antivirus scans. To add a folder, choose 'Folders' from the 'Add' drop-down. The 'Browse for Folder' dialog will appear. The drive partition/folder will be added to Excluded Paths. Choose 'Files' from the 'Add' drop-down. The file will be added to Excluded Paths. Repeat process to add more files. 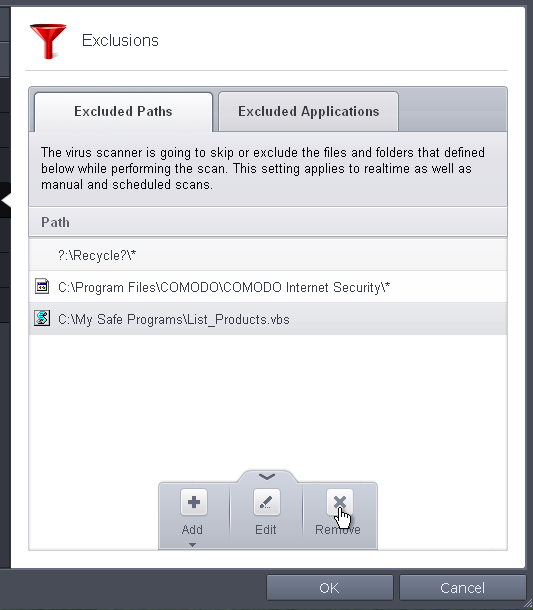 The items added to the Excluded Paths will be omitted from all types of future Antivirus scans. Select the item, click the handle from the bottom center and select 'Edit'. 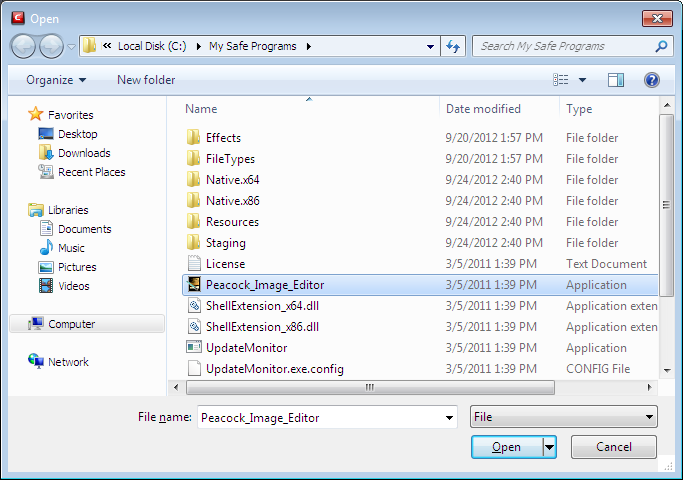 Make the required changes for the file path in the Edit Property dialog. Select the item, click the handle from the bottom center and select 'Remove'. Click 'OK' in the 'Advanced Settings' dialog for your settings to take effect. 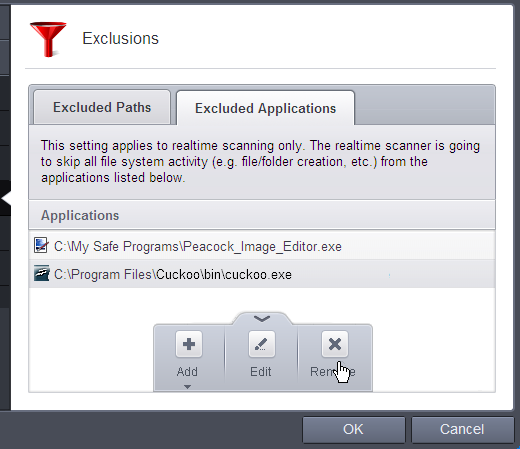 In addition to programs, applications or files added to Excluded Applications automatically on selecting Ignore action from the Scan Results window, you can manually add programs, applications of files to Excluded Applications list for excluding them from real-time scans. Also you can remove the items from Excluded Applications that were added by mistake. Selecting it from the running processes - This option allows you to choose the target application from the list of processes that are currently running on your PC. 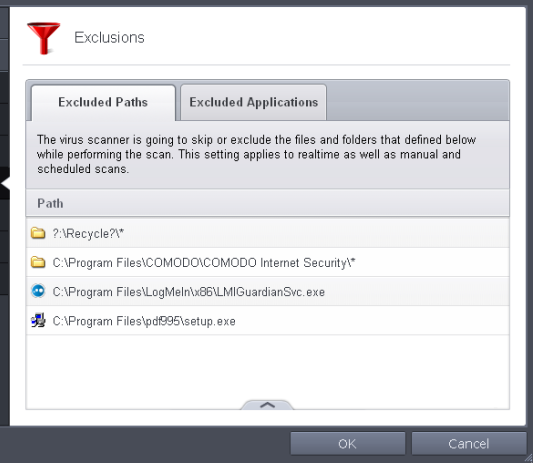 Browsing your computer for the application - This option is the easiest for most users and simply allows you to browse the files which you want to exclude from a virus scan. 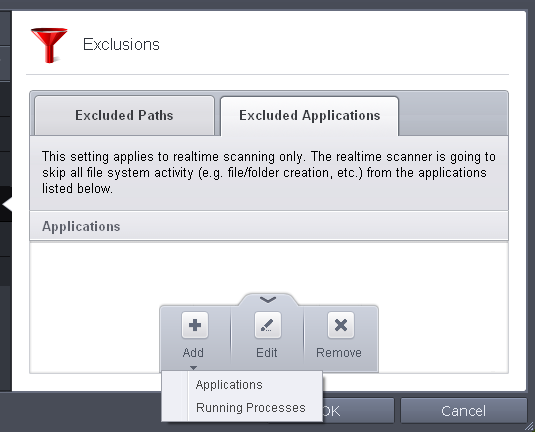 Select the process, whose target application is to be added to excluded applications and click OK from the Browse for Process dialog. The application will be added to Excluded Applications. The file will be added to Excluded Applications. Repeat process to add more items. The items will be skipped from future real-time scans. 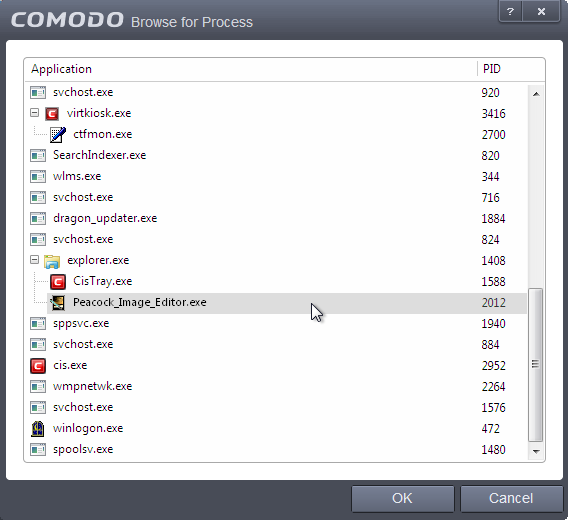 Select the application, click the handle from the bottom center and select 'Edit'.